How to Choose The Best Hunting Spotting Scope? 2.1 What is a spotting scope? 2.2 What is the purpose of a spotting scope? Out in the wild, most game animals have superior senses than us humans. If you want to bag a successful kill, you need all the help you can get from your weapons and hunting accessories to level the playing field. One important tool in the long distance hunter’s arsenal is the spotting scope. If you want to spot your quarry from a distance before it clocks in on your position, you need superior optics. With the best spotting scope for hunting, you can sway the odds of a successful kill in your favor. But many hunters don’t even use a spotting scope, settling for a pair of binoculars or a monocular instead. While they both have their merits, they cannot compete with a spotting scope in the distance game. If you are interested in the hows and whys, please check out the buyers guide at the end of this page. In the meantime, let’s get things started with a look at some of the best rated spotting scopes out there on sale at this moment. If you want the best quality lens, European manufacturers are a safe bet. Owned by the world famous Swarovski brand, Swarovski Optik is one of the leading names in premium lens and optics. And the HD STS 80 is a high-end spotting scope from the Austrian manufacturer. The asking price is nearly four times as much as the nearest competitor in this list, but you do get a whole lot of performance here. 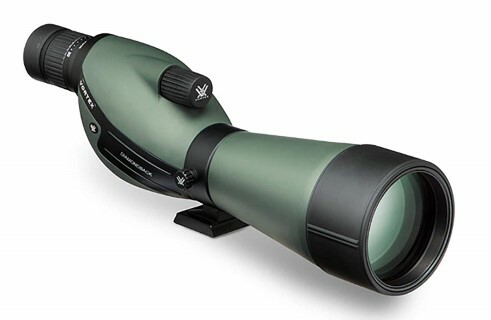 Thanks to the large 80mm high-quality glass used inside, this is the only scope on our shortlist capable of hitting a max magnification of 80x. This is a premium straight body scope. It has a removable eyepiece feature, and no eyepiece is sold as part of the package. You will have to buy those separately. The build quality of the casing is excellent, with rubber armoring for shock protection. This scope will survive dips of up to 13 feet under water. It is also dust proof. The lens is also very durable, with a special protective coating that makes them easy to wipe and clean. The color reproduction and image quality are the best out there. This is an excellent choice for birders, wildlife photographers, and of course, hunters. This scope has a close focus of 16 feet, which is better than most scopes on the market. At a shade under 3 lbs (with the eyepiece), the scope is quite portable too. At just 13 inches, it is also quite compact. With best in class build quality and a limited lifetime warranty, this scope is the dream choice of many out there. Vortex is a very reliable brand in the world of hunting optics. The Wisconsin-based company is known for their good quality spotting scopes, binoculars, and riflescopes. The Razor HD is an angled scope armed with a 65mm objective lens. 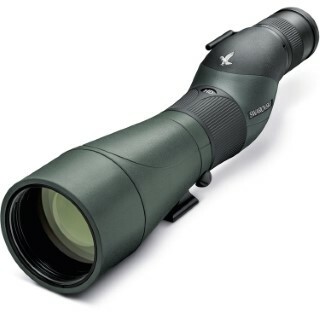 The performance of this scope falls comfortably within the mid-range, with 16-48x magnification on offer. The clarity and image reproduction cannot be faulted at all. The specially coated lens and Porro prism do a commendable job on this scope. The Razor HD comes with an eyepiece and carrying case. Since this scope has a removable eyepiece design, you can add a choice eyepiece of your own if you desire. You can also buy a tripod and car window mount separately from the same manufacturer. At 6.6 lbs, this is definitely not the lightest scope out there. But it is still easy to carry around, and for the asking price, we definitely cannot ask any more of it. The performance of this scope is excellent from 100 yards all the way to 1000 yards. Even at max 65x magnification, the image quality and color reproduction remain stable and reliable with no hint of fuzziness. It may not have the level of protection against dust/moisture available on other high-end models, but the Razor is still a very capable and reliable spotting scope in its own right. The Japanese brand needs no introduction whatsoever. They have a strong presence in cameras and optics. The Prostaff 5 is an angled body spotting scope from the famous Tokyo-based imaging giant. There are two variants of the Prostaff 5. The one featured here is the larger 82mm objective lens model. This one has a max zoom capacity of 60x when paired with the default eyepiece. The other variant has a smaller 60mm lens and 48x max magnification. The close focus is also quite decent at around 20 feet. The 80mm lens comes with a multi-coating for decent color reproduction and clarity even at max 60x magnification. The scope uses a lightweight Porro prism and weighs in at around 4lbs, which makes it lighter than the Vortex Razor. The overall build quality is outstanding, with a dustproof, waterproof, and fog proof body. The scope even has a sliding sunshade, which is a boon in bright light conditions. 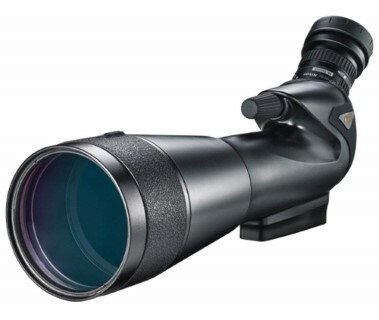 On the whole, this is a very capable mid-range scope for hunting and birding. The controls are quiet and easy to use. The magnification levels are easy to adjust, and the angled design makes it easier to use for a longer duration. The eyepiece is also adjustable, which improves the overall viewing experience. Nikon also has got the pricing spot on for a scope that sports a premium 80mm lens. The second spotting scope from the ever-reliable Vortex brand on our list is available in both straight and angled configurations. The model featured here is the angled version. The XR lens inside is a mid-range 60mm version. The glass has premium multi-coated construction for excellent optical performance. The magnification is excellent at 20-60x, and as usual, you get constant performance at all levels of magnification. The overall performance is below the much higher specced Razor, but it is still more than adequate for birding and long distance hunting. The scope has a lot of adjustable features, including a movable collar and adjustable eyecup. The comfort level provided by this scope is comparable to the premium brands out there. The eye-relief of 0.78 inches makes it excellent for folks with glasses as well. The body of the scope has premium build quality. It has o-ring seals, rubber armor, and nitrogen purging for maximum protection against the elements. The lens is fog-proof and waterproof, though we wouldn’t recommend dipping it in water for an extended period! Overall, the Diamondback is another affordable scope from Vortex that delivers reliable and acceptable mid-range performance. If you want something more than low end, bottom tier optics, this is a solid choice. In the world of scopes and binoculars, Bushnell occupies the affordable lower end of the market. 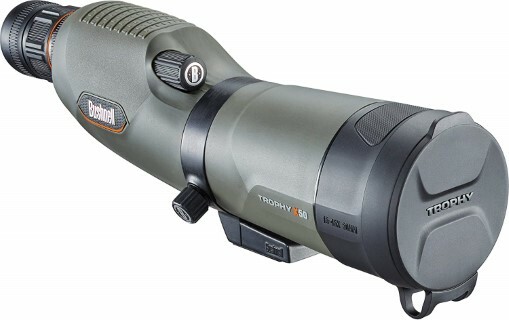 If you are on a tight budget and need a spotting scope, Bushnell is probably your best bet. The Xtreme is available in two sizes, the smaller one has a 50mm lens, while the larger variant we reviewed had a 60mm lens. Unlike premium models, the Xtreme comes loaded with goodies like a tripod, car window mount, carrying case, hard case and scope glove. The lens is a low-end glass, but it does get multi-coating for improved performance. 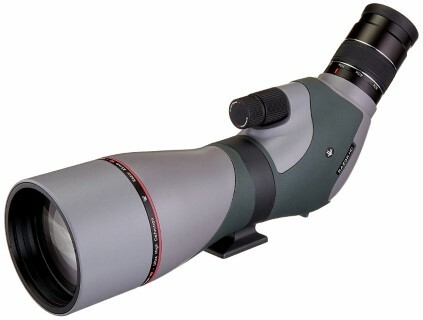 The adjustable range of magnification on offer is between 20 and 60x for the larger variant (48x max on the 50mm lens.). The close focus is quite good at 12 feet. The eye relief of 14mm makes the Xtreme a safe option for folks with glasses. At 1.3lbs, this is an ultra-lightweight scope. But don’t expect the ruggedness or build quality of high-end models here. They do promise protection against water and fog, but it is not the best out there. This is a very basic scope that can deliver acceptable performance up to a 100 yards max. But beyond that, and at higher magnification levels, clarity takes a nosedive. But at the low asking price, you cannot expect anything more. Only buy this Bushnell if you are on a tight budget. A spotting scope is a small, portable telescope designed to look at objects on earth. Their shape and silhouette are similar to a telescope (but shorter), and they are usually mounted on a small tripod. These mini telescopes are used in the military by snipers, and by hunters and wildlife enthusiasts in civilian life. What is the purpose of a spotting scope? People use a spotting scope in those instances when they need more magnification than what a regular binocular can provide. When you want to spot small objects/animals hundreds of yards away, a spotting scope is an optimal choice. They have several advantages over other types of optics. Thanks to their superior magnification, they can be used to catch close up photographs of animals in the wild. And if you like guns more than cameras, these scopes allow you to get an accurate look at your quarry before taking a shot. They are also useful for long distance target shooting at the range. Telescopes are bigger and more powerful than a spotting scope. But that also makes them heavier and less portable. Telescopes provide an upside-down image, which is not a problem when you are looking at the stars and planets. But when looking at terrestrial objects, this is inconvenient, to say the least. Scopes work well within the range of your hunting rifles, and also provide an upright image, thanks to the special image erecting prisms they have. They are also more rugged than telescopes and are built to be waterproof, dust proof and fog proof. Binoculars are more compact and more comfortable to carry around. And they don’t need a tripod at all. But magnification is where scopes outshine binoculars. Even the best binoculars have between 8-16x magnification. For scopes, the lower end of their magnifications starts at 15x and tops off at around 60-80x. Some high-end scopes can have a max magnification of over 100x! They are the best option if you want to get a real close look at something hundreds of yards away. Scopes are not meant to replace binoculars altogether. They both serve different purposes. And in ideal situations, you should try to use both while out in the field. For instance, binoculars with their wide field of view are excellent for taking sweeping looks at the distance, to spot movements. And if you do catch any movement, a scope will offer enough magnification to zero in on your potential target. Both types should work well in general situations. They have a similar range of magnification capabilities. You should pick one based on the terrain that you will be encountering during any future hunts. The general rule in optics is: if you have to choose between the quality and size of a lens, go for the quality, every single time. Bigger is not necessarily better when it comes to objective lens used in telescopes, scopes, and binoculars. Only go for a larger lens if the quality is identical for both. In that instance, the larger lens will give better magnification and better image quality. But as a downside, the bigger the size of the lens, the more expensive the scope usually is. As already mentioned, you might find high-performance scopes with a max magnification of a 100x or so. But most products on the market tend to have an upper ceiling of 60-80x. And in most scenarios, you will need between 30-40x at most. So most scopes in the market will give enough performance in this range. If you want better quality, look for scopes with a bigger lens. Manufacturers coat objective lens with special substances to improve their performance. These substances improve the light transmitting capacity of the glass. This can make a significant impact on image quality at higher magnifications. The options include fully coated, multi-coated, and fully multi-coated, in increasing degrees of quality and performance. This feature is extremely important if you wear glasses. The larger the eye relief, the lesser the problems for folks with glasses. This feature determines how far away your eyes can be from the eyepiece to get a full FOV. Basic minimum eye relief of 14mm is recommended for users with glasses. Some scopes have a removable eyepiece, while others come with fixed eyepieces. In higher end scopes, removable scopes are quite common, and often you do not get any eyepiece with the package. This allows you to pick an eyepiece of your choice separately, instead of being stuck with the default piece. Zoom eyepieces are very useful, as they provide superior relief and image quality. Most spotting scopes cannot focus on objects less than 20 feet away. This is called the close focus of a scope. If you plan to use the scope nearby objects as well, look for models with lower close focus ratings. 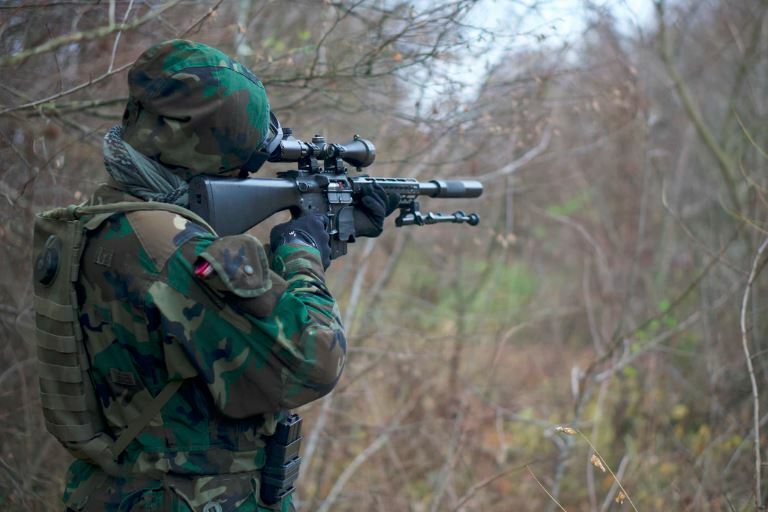 These scopes are expected to withstand rough use out in the woods and forests. So always look for models that come with foolproof, waterproof and dustproof exteriors if at all possible. O-ring seals and nitrogen purged bodies are standard in this niche. Optics need utmost protection against moisture and dust. Otherwise, the image quality will suffer a lot. You cannot use a spotting scope properly without a tripod. Now, most of the high-end models are sold without a tripod. You will have to buy a compatible tripod separately. If you want to use the scope from inside a vehicle, you can also buy a car window mount. All scopes come with standard threading, like digital cameras. So you only need to worry about the weight capacity of the tripod. Match it to the weight of the scope, and you are set to go.